The previous article outlined how p53 isoforms are changing our view on how TP53 is involved in so many different functions in the cell. Where we used to think there was only one p53 protein doing everything, we now know there are many proteins – referred to as isoforms. 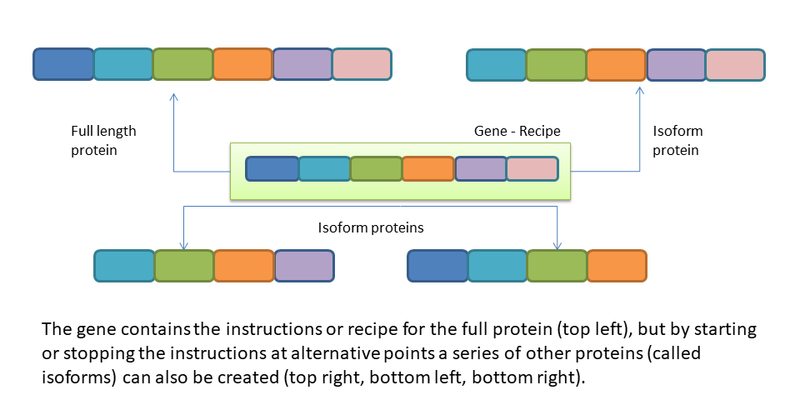 For example, in the graphic below a gene, shown in the green box the centre of the image contains the instructions for a full length protein (top left), but by ‘reading’ the recipe at different start and stop points other isoforms are also created (top right, bottom row). This is a much simplified picture that ignores a whole lot of complexity of course, and if you haven’t read the previous article it might be worth taking a look now. How do gene mutations change this picture? In the graphic below we have the same gene in the green box, but in this case the start of the gene contains a mutation at the beginning of the gene. As we can see, the full length protein contains the mutation and so does one of other isoforms. 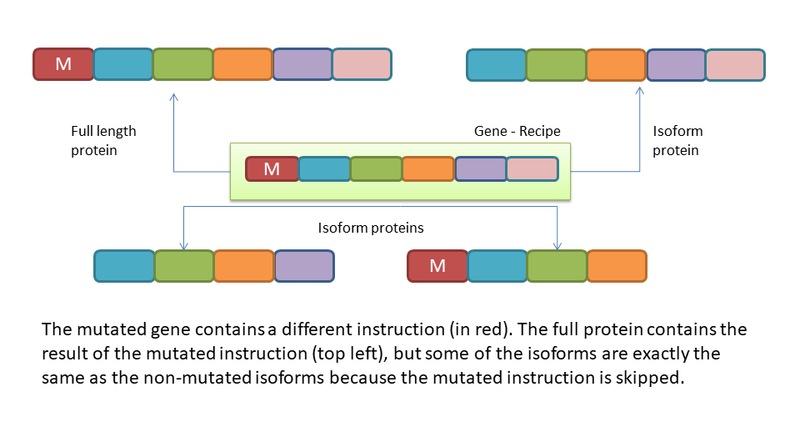 But there are also two isoforms which don’t contain the mutation and match perfectly the same isoforms from the non-mutated version of the gene. In the case of LFS it means that for someone with a mutated TP53 gene might be producing some mutated isoforms and some non-mutated versions. This means that those functions of the TP53 which depend on the isoforms which are not mutated will be working in the same way as they do for people without LFS. In other cases those cell functions which depend on the mutated isoforms won’t work in the same way as they do in the general population. As previously explained, the first part of our collaboration with Dundee University will be looking for the first time at cells from people with LFS to try and understand what range of isoforms exist – it may well be that there are in some cases isoforms that don’t even exist in non-affected individuals. When human cells are cultured in the lab they have a limited lifespan unless they are cancer cells or have been specially engineered as ‘immortalised’ cells. However, cells from people with LFS have been shown to have the capacity to ‘spontaneously immortalise’. This is generally viewed as being related to the increased cancer risk associated with a mutated TP53 gene – and it’s markedly different to what happens to cells from people without LFS. Note that this spontaneous immortalisation doesn’t mean that the cells have necessarily become cancerous – but it’s one of the most important steps in that direction. The question we want to explore in the second phase of our p53 isoforms project is whether a range of commonly used drugs can influence this process. We want to know if there are drugs which stop LFS cells from undergoing spontaneous immortalisation and also whether there are drugs which make it more likely. The drugs in question are medicines which are commonly used to treat chronic conditions and have a low enough risk of side effects that they can be taken for many years at a time. Our thinking here is obvious – we want to find candidate drugs which stop that first step towards cancer so that we can move on to thinking about testing them in animals and ultimately in people. We want to find drugs which people with LFS can take so that we can reduce the risk of cancer as much as possible. Our drug list includes aspirin, metformin, propranolol, cimetidine, omeprazole and more. These are low cost, low risk drugs which are ideally suited for long-term use. In addition to drugs we will also look at some supplements, such as vitamin D3 and l-arginine. In addition to looking at the effect on spontaneous immortalisation we will also look at other cell functions that are relevant to cancer, such as cell motility (the ability of cells to move – related to how cells can invade tissues for example). It’s this second part of the project which has the most exciting potential for the future. Our research agenda at the George Pantziarka TP53 Trust is simple – we want to focus research on active means for reducing cancer risk.